Capt. 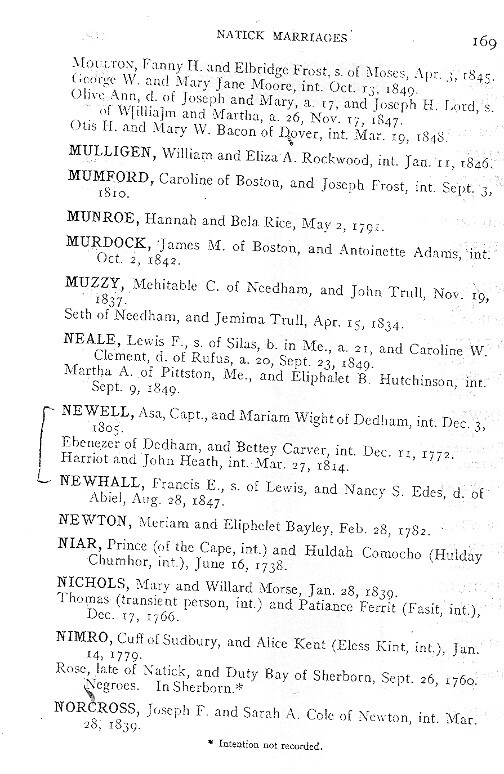 Asa Newell and Miriam White filed intent to marry December 3, 1805, in Natick, MA. Olive Ann, d. of Joseph and Mary, a. 17, and Joseph H. Lord, s.
Murdock, James M. of Boston and Antoinette Adams, int. Neale, Lewis F., s. of Silas. b. in Me., a. 21, and Caroline W.
Martha A. of Pittston, Me., and Eliphalet B. Hutchinson, int. Nimro, Cuff of Sudbury, and Alice Kent (Eless Kint, int. ), Jan.
Rose, late of Natick, and Duty Bay of Sherborn, Sept. 26, 1760. Norcross, Joseph F. and Sarah A. Cole of Newton, int. Mar.